Brewing the bone chilling cold weather and sub zero temperature with biting cold as a part of Kargil district, Sankoo sub division of kargil celebrates on Monday to mark 40th anniversary of the 1979 Islamic revolution that toppled the U.S.-backed shah, overturned 2,500 years of monarchical rule and brought hard-line Shiite clerics to power. The festivities start every year on Feb. 1 — the day Ayatollah Ruhollah Khomeini returned home from France after 14 years in exile, to become the supreme leader of the Islamic Republic of Iran.on the night of the 10th February 2019 the mosques,Imam Bargah and roof of residential houses with illumination and brightness thousand of people’s participated in these religious congregation from different villages of sankoo suru to commemorate the 40th anniversary of the islamic revolution in thousand to remember the day and the sacrifice made during the revolution which saw the Pahlavi regime cracking down on protest and demonstration ruthlessly. The celebration on 11th February mark the victory of the 1979 Islamic revolution Led by Ayatullah Imam khomeni (R.A) which put an end to the monarchical rule of the US backed pahlavi regime this was also a day of paying tribute to those who sacrifice their lives during the revolution.The day of Imam Khomeini’s return to Iran from exile (Feb 1, 1979) marks the beginning of the Ten-Day Dawn in ceremonies which culminate with the anniversary of the victory of the Islamic Revolution on February 11, 1979. In this regard an impressive rally and congregation were witnessed in sankoo, this event was organized by Anjuman-e-Sahib Zaman sankoo (suru) with great religious zeal and enthusiasm. 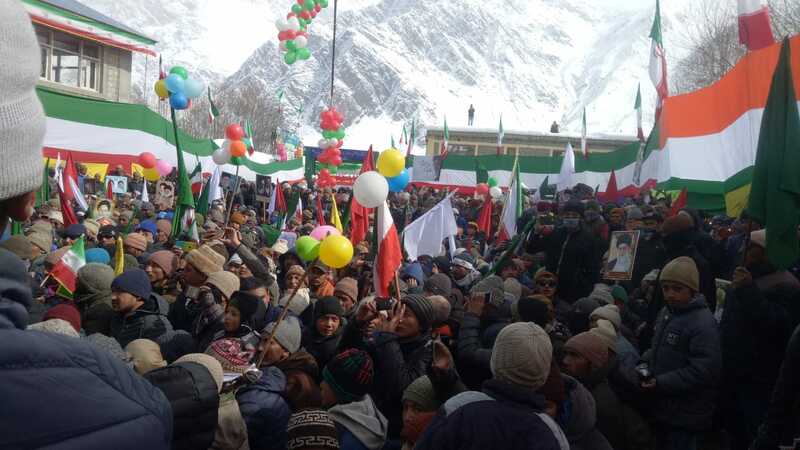 Wherein thousand of men, women and children were took participated in this congregational gathering.the peoples were seen holding their play card and raising many chants slogan and write Down with America, Down With Britain,Down with Israel,and shouting slogan Hum Rehberi Hum Merjei Khomini, Khomini Allah-hu-Akbar takber and also holding playcard photo of Imam khomeni(R.A)and yielding supreme leader and voicing their continued support to the revolution. Prominent amongst other religious scholar were present includes Hujatul islam walmuslimeen Hujatul islam walmuslimeen Aga Syed Muslim Mousavi Lankerchey,Shiekh Mohd Muslim Faroona and other religious scholars were alsopresent on this occasion. Speaking on the occasion religious scholars spoke on victory of the islamic revolution in iran under the leader of Imam Khomini(R.A) has change the world the gathering condemned in strong world brutality and atrocities afflicted on the people of these country by its tyrant ruler.the gathering also condemned world arrogant power pertinent to mention said that after year of hard struggle and sacrifice of thousand of men and women.the irain nation succeeded to overthrow 2500 year old monarchy and bringing in Islamic government based an islamic principles under the leader of Iman Khomini(RA) on 11 february 1979. Report analysis that Islamic 40th anniversary of the victory of islamic revolution were also celebrated in Sankoo it was organized by Markaz-e-Tabliga Imam Raza Sankoo,Maktab-e-Hyderiya Lankerchey(Anjuman-e-Sahib Zaman) and various locations such as,Taisuru, Anjuman-e-enqalab Mehdi,Purtikchay, thangboo,Kargee, Tangole Barsoo, Saliskot villages been reported.